Cruise Ship Loses Engine In High Waves Off Norway As Passengers Evacuated Helicopters were being used to evacuate some of the vessel's 1,300 passengers after its crew issued a mayday call on Saturday amid engine problems, high seas and strong winds. 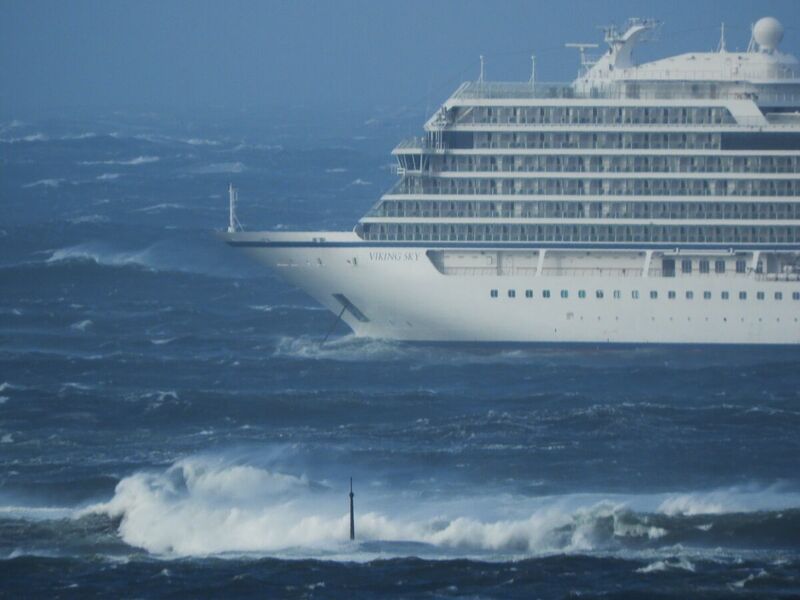 The Viking Sky cruise ship sent out a mayday call on Saturday after encountering engine problems amid high seas and strong winds. A cruise ship off Norway's western coast was evacuating its 1,300 passengers after losing power and issuing a mayday call on Saturday. Helicopters and boats were helping with the evacuation, which is expected to continue for many hours, The Associated Press reported. The Viking Sky, operated by Viking Ocean Cruises, was experiencing engine problems, the Norwegian newspaper VG reported. At the time, the cruise ship was also encountering high seas and strong winds, the newspaper said. The ship is in Hustadvika bay, an area that, as Reuters reported, is known "for fierce weather" and "shallow waters dotted with reefs." The Norwegian government is studying whether to "build a giant ocean tunnel through a nearby mountain to improve safety" in the bay, according to the news agency. After the crew was able to restart one engine, police say, the Viking Sky moved farther offshore and dropped anchor. So far, only about 100 people have been evacuated, according to the AP. An earlier version of this story misspelled Hustadvika as Hustadsvika.